The early years of the six-member Arnold household were lean. Mom was a genius at devising recipes with hamburger. There was no disposable income. There were no luxuries. The bank account was like the proverbial turnip from which no monetary blood could be squeezed. Vacations were never to the beach or mountains or theme parks. Our vacation was a trip to my paternal grandparents’ home in Richmond, Virginia. The journey from Nashville to Richmond began in the predawn hours and ended well after dark. This was before the Interstate system, and two-lane highways on the map led through cities and towns and twisting through the Blue Ridge Mountains. If we got stuck behind an eighteen-wheeler, we would almost be asphyxiated by the diesel fumes before being able to pass. The fast-food industry had not yet popped up like gastronomic weeds, so Mom would prepare snacks and full meals for the drive. 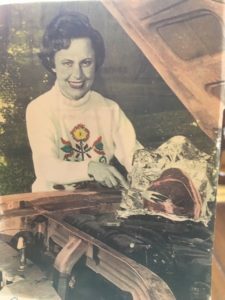 Our favorite was her roast beef and vegetables wrapped in heavy-duty aluminum foil. Dad would secure it on top of the manifold of the engine where it would slow cook until we got to Bristol, and we would stop at a roadside picnic area and feast. My parent’s oft repeated mantra uttered in weary sighs was, “It’s hard to get to Richmond.” But once we pulled into the driveway, our exhaustion soon dissipated. The Arnold grandparent’s home was a place of magic and mystery. 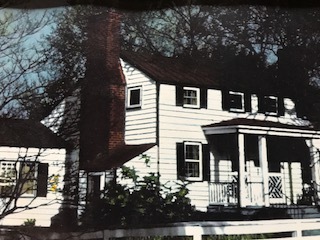 A two-story house built in the 1830’s, on a couple of acres, with an expansive backyard devoted to a beautiful flower and lush vegetable garden. There was a huge oak tree in the front yard, so tall that its thick leafy crown was visible for several miles in every direction. Even holding hands and stretching our arms, the Arnold kids could not gird the circumference of the tree. At the base of the tree were several Civil War era cannonballs; the house served as a field post for a brief stint during that time. We played with the unexploded ordinance without ever worrying about its potential lethality. 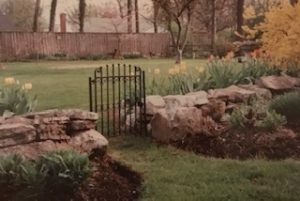 In the reverie of youth, I had no appreciation for the beauty of the garden or that my grandmother was a master gardener, a gift she handed down to her only child, my father. The “green fingers” or “green thumb” expression came into existence in the 1930’s and would apply to both mother and son. Their ability to grow varieties of flora or foodstuffs wherever they dug their trowel into the earth was uncanny. But planting and growing was more than a utilitarian exercise. 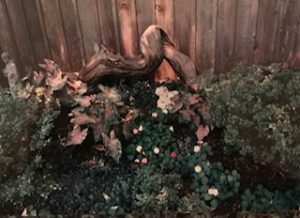 Just as an architect would dream of spaces of beauty, so the creative natures of my father and grandmother would design unexpected pockets of beauty spaced throughout their miniature landscapes. I say “unexpected” because both mother and son enjoyed the element of surprise when they rounded a corner and came upon a beautiful cluster of blooms they had planted earlier now exuberant with color and shape. The Richmond garden had a main path running down the middle from one end of the backyard to the other. On either side of the main path were floral neighborhoods each with its extravagant variety of specie. At the south end was the garden house and beside it, a mound of compost. A kid could almost scale it were it not for the slippery substance of decay. I made my share of trips to the compost pile carrying an overflowing colander of kitchen biodegrades. My paternal kin were survivors of the Great Depression in rural Virginia and nothing was wasted. They took from the earth and gave back to it in vegetable scraps and wilted flowers. The north end opened onto a grassy square with a bordered edge of berry and butterfly shrubs; a haven for birds, squirrels, rabbits, and a kaleidoscope of butterflies. 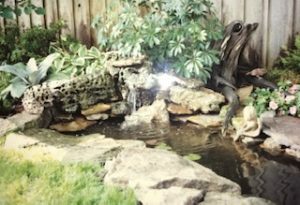 I became a collector of butterflies and moths over a summer we spent in Richmond while Dad worked on a construction crew to bring in the extra money needed for the family. His teaching job did not offer employment from June through August, so a summer was spent in Richmond. The varieties of butterflies and moths I did not find expired on the ground or in the bushes, I captured with a homemade butterfly net crafted by my grandmother with a broken broom handle, a coat hanger redesigned and attached to one end, its circular shape covered in old, cut-to-fit stockings, and then gently “put to sleep.” I bagged enough species to fill several shadowbox glass frames that the grandparents displayed on the wall. Their oohs and aahs of admiration made me feel like an artist, yet one with a mild guilty conscience for how a few captives had sacrificed their lives for my exhibit. In one corner of this grassy square was a large stone fireplace. It had a tall chimney framed by giant boxwood on either side. When we entered the north end of this space it was as if coming upon the altar of some extinct tribe. This wonderland fevered my imagination. In the reverie of creative adventures with my siblings, I did not know or care about unaffordable vacations to beaches, mountains, or theme parks. In the case of my grandmother, the romantic mythology of one having “green fingers” did not apply. The fingers of my grandmother were rough and dirty from digging in the earth, planting, pruning, and harvesting her produce. She washed her hands before meal preparation, but hers’ were not green by any stretch of the imagination. Even when scrubbed, her hands bore the dark stains of soil and plant. Dad’s water pond; angel cherub sits in Kay’s herb garden. It was the same for Dad. Once my parents got their children educated, employed, and married off, there was money to invest in the yard. I did not appreciate Dad’s gift until much later in my life. I would drop by and find him in the backyard, on his hands and knees digging, planting, or harvesting, his body wet with sweat, his hands and fingers dirt caked, always eager to give me a tour and pick a bouquet for me to take home to Kay. Years ago, I cast Dad as the Gardner in a production of “The Secret Garden” for Nightingale Theatre. The show ran for two weeks at Cheekwood Botanical Gardens. Perfect casting. Perfect location. 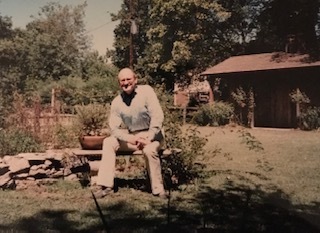 In early June of 2002, Dad’s garden was in peak bloom, a result of weeks of labor. He wanted to put the eagle weather vane from Richmond on top of his garden house. He was not feeling well at the time, and he had our daughter, Lauren, climb up the ladder to the roof. It was a tricky job, so Dad followed after her, and together they mounted the weather vane on top of the faux chimney. A few days later, Dad shuffled off his mortal coil. I hope when I go to meet my Creator I am in the middle of some creative project like my father. Dad’s Loch Ness driftwood captured from the banks of the Harpeth River with St. Francis; the statue now relocated in our garden. This spring as Kay and I work up our garden—she is head gardener, and I her head weed-puller—and I bump into the artifacts inherited from my Richmond grandmother and my father, and as I hear the squeals of pleasure from my grandchildren running along the garden paths or playing in the fountain or chasing after the butterflies (we employ a capture and release program now), I watch with joy as they marvel in wonder at the magic spin-wheel cups on the weather vane catching the wind and twirling through the sculpted holes of eternity or as they jump from rock to rock with an occasional misstep that draws blood and tears and requires band aides and comforting words in the embrace of a parent or grandparent, or listen to them conversing with the statue of St. Francis, or traversing the stone border wall as if it were a balance beam, or racing their bicycles like daredevils down the ramp they have constructed from the large stone steps, I ponder what rich and fertile memories they are storing up, and I remember my own childhood adventures in the gardens of my grandmother. I am confident that the memories of our two daughters are chockfull of wonderful moments of time spent in their grandfather’s garden. And now our grandchildren are creating their memories in our garden of delights. This is a blessing handed down to the third and fourth generation.